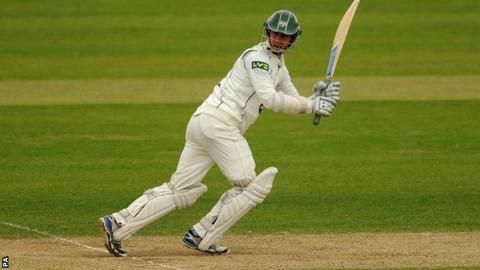 Worcestershire have chosen not to offer a new deal to opening batsman Matt Pardoe, whose contract expires at the end of the season. The 23-year-old left-hander has made 2,291 runs in 56 first-class matches at an average of 24.63 since making his debut in 2011. But he lost his place following the successful early season signing of fellow opener Richard Oliver. The county have also released 30-year-old fast bowler Graeme Cessford. The Northumberland-born Royal Air Force corporal was recruited in November 2012 as part of an RAF Elite Athlete Programme. After making his debut against Oxford MCCU in May 2013, he has gone on to take 17 wickets in six first-class appearances, but has not featured for promotion-chasing Worcestershire's first XI in any form of the game this summer. "I would like to thank the club for the past 10 years from a youngster on the Academy to the present day," said Stourbridge-born Pardoe. "It was fantastic growing up under the guidance of Damian D'Oliveira and playing first-class cricket for Worcestershire." Worcestershire have two Championship matches left this summer, the first of them at home to Surrey at New Road, starting on Tuesday. And they had it confirmed on Saturday afternoon by the England and Wales Cricket Board that they will have star all-rounder Moeen Ali back from England duty for both the county's final two matches. Birmingham-born Moeen is expected to make his final international appearance of the summer in England's Twenty20 game against India at Edgbaston on Sunday.